1979 Revolution: Black Friday is a game conceived by people who might not ever be able to go back to their native Iran, because they’re daring to create a document from its history. Despite the fact that game-maker Navid Khonsari is suspected of spying by the Iranian government, the primary takeaway from playing 1979 Revolution is a feeling of complicated affection, not angry bitterness. There’s another side to what we in the West know about Iran, and playing this game is a good way to start learning about it. Video games have been playing with history and politics for decades now. But big-budget games like Medal of Honor and Call of Duty that have used Middle East wars and insurgencies as the backdrop have come across like money-grubbing tourists who exploit real-world tension for potential sales. In games like these, Iran and other Middle Eastern countries are just exoticized pit stops. To many in the West, Iran is an indistinct enemy power that seems perpetually embroiled in internal conflict, a country currently led by a volatile leadership with dangerous nuclear ambitions. Outside of unlikely successes like Marjane Satrapi’s graphic novel Persepolis, the personal and historical perspective of actual Iranians doesn’t get a lot play in Western mainstream media. With the majority of headlines focused on top-down oppression, Iran looks like a mess from the outside looking in. But it’s also home to millions of people, many of whom have lived through political crucibles that American, British and French citizens could never imagine. 1979 Revolution’s mission is to shed light on what it means to bleed and suffer for freedom in one’s home country. 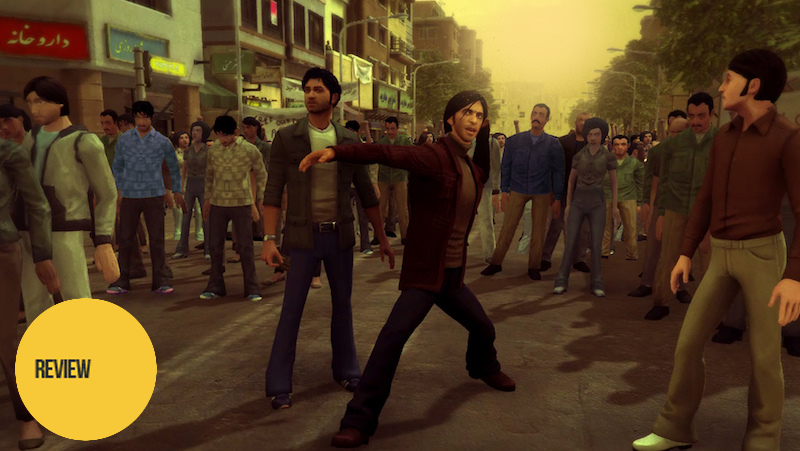 The game opens in 1980 with lead character Reza developing pictures of protests taken in the streets of his homeland. The majority of the game happens in flashback, showing Reza getting pulled into a multi-faction insurgency movement after coming back home from his studies in Germany. The late 1970s saw Iran boil over with near-universal dissatisfaction with Shah Reza Pahlavi, the monarch backed by America and other Western powers. As 1979 Revolution goes on, Reza finds himself entangled in the idealism, suspicion and heartbreak of an underground political protest movement. Photography is Reza’s superpower. His passion for taking pictures becomes a powerful weapon to help alert the world to oppressive state violence. During certain sequences, players will walk around the environment and take pictures in specific spots. Those shots get collected in a journal where real-world photographs sit next to their in-game recreations. One of 1979’s bigger successes comes from reconstituting the dangerous context of what it meant to take those photographs. Reza gets battered by police and erstwhile allies alike for the simple act of snapping his lens at what’s happening around him. 1979 Revolution feels clunky and rough-hewn at times, and it isn’t a graphical stunner by any means. But the music and voice acting are done well enough to pull players into the drama of the movement trying to unseat the corrupt government of Iran. 1979 drives home the human cost of regime change and does a great job of showing what was at stake for the people protesting in the streets of Iran. The game is built on a dialogue choice template that also folds in a few quick-reaction action sequences. It’ll feel very familiar to anyone who’s played a Telltale game in recent years. The drama here comes from Reza’s personal connections across the disparate sections of the political landscape. His childhood friend Babak introduces him to the protest movement, and his brother Hossein is a police officer carrying out orders to suppress dissent. Reza’s cousin Ali is a mujahideen soldier who feels that nonviolent demonstrations won’t bring about the change Iran needs. Along the way, Reza’s connections to each of these men shift as he says certain things to them. Players’ choices feel consequential here, impacting the cohesion of both family units and the rank and file of rebellion. Allies and family members get disavowed, go missing or, in one case, get tortured right in front of Reza’s eyes. I got confused trying to keep track of which faction espoused what belief while playing 1979. That philosophical dizziness feels intentional, meant to replicate the rush of ideas and political messaging swirling around the common Iranian citizen of that era. It’s one thing to know that the regime in power is wrong but it’s another to know which faction should be the one to rule in its stead. 1979’s creators don’t offer up comforting platitudes or a heartwarming feel-good ending, choosing instead to lean hard on ambiguity and the grim truth of real world facts. Most importantly, 1979 Revolution doesn’t feel like a corny edutainment game that you’re going to get quizzed on for midterms. It comes across as a political melodrama, grounded with real-world details. Like Never Alone and Papo & Yo, this is video game creation driven by the desire to use the medium to break down cultural barriers. The research and intent poured into 1979 Revolution is palpable. The bits of Farsi sprinkled into the dialogue, insight into the country’s pervasive anti-Americanism and moments where you hear both the dangerous zealotry and peaceful comfort to be found in Islam make the characters and milieu feel three-dimensional. This is a game that can broaden an individual person’s horizons and that of the entire medium, as well. It’s definitely worth your time.